Are you looking for an exceptionally beautiful spa hotel? 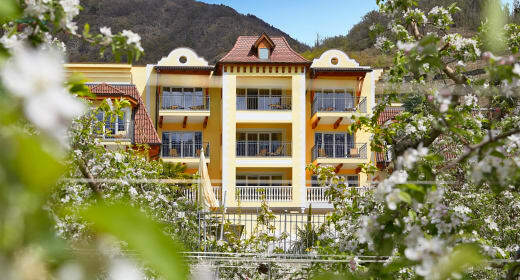 Dolce Vita Hotels in Northern Italy are the first address for beauty and spa in the merano region. Experience limitless spa fun at the Dolce Vita Hotels in Naturno and Latsch near Merano: book one hotel room, enjoy the amenities of all hotels! Almost too good to be true: book a room at a single Dolce Vita Hotel and you have free access to the wellness, spa and beauty facilities at all Dolce Vita Hotels. Enjoy beauty and spa in South Tyrol - within a radius of only 11 kilometres in the beautiful Vinschgau Valley. Why not combine relaxation and fitness during your holidays in Italy? Enjoy a bicycle tour from one Dolce Vita Hotel to the next. Once you arrive, treat yourself to modern spa comfort and a marvellous beauty pamper programme. Recommendation: Merano is a spa paradise of thermal baths in South Tyrol. Why not try the well-being attractions of the spa resort yourself? Highly trained beauticians will spoil you with beauty and pampering treatments with precious substances `from` mother nature. The beauty and the power of the mountains unite in the certified organic BERG cosmetics brand. BERG cosmetics will make you radiate with natural beauty. Would you love to take a piece of South Tyrol home to your own bathroom? All products of the BERG cosmetic line and interesting information are available at the online shop. 1.847 square metres of water at 24 swimming pools make the DolceVita Hotels a paradise for bathing aficionados. You will be spoiled for choice between the 31 saunas at the Dolce Vita spa hotels in Northern Italy. Enjoy effective and sustainable beauty, wellness & spa at your cosy beauty hotel in South Tyrol. BERG cosmetics are free of artificial preservatives and colouring, mineral oil and paraffin.